vStill stung by the Blues missing the playoffs for the first time in six seasons, general manager Doug Armstrong capped a major roster overhaul on the first day of the NHL's free-agency period by acquiring centre Ryan O'Reilly in a multiplayer trade with the Buffalo Sabres. BUFFALO, N.Y. — Still stung by the Blues missing the playoffs for the first time in six seasons, general manager Doug Armstrong capped a major roster overhaul on the first day of the NHL's free-agency period by acquiring centre Ryan O'Reilly in a multiplayer trade with the Buffalo Sabres. Aside from landing a nine-year veteran in O'Reilly on Sunday, St. Louis committed $31 million in salary to sign forwards David Perron and centre Tyler Bozak to multiyear contracts. The Sabres added experience to a young roster by acquiring veterans forwards Vladimir Sobotka and Patrik Berglund. They also acquired forward Tage Thompson, a 2016 first-round draft pick, who had three goals and six assists in 41 games as an NHL rookie this season last year. Buffalo rounded out its haul by adding a conditional first-round draft pick next year and a second-rounder in 2021. The Blues also agreed to pay O'Reilly the $7.5 million contract bonus he was due by the end of the day. Botterill said the price for O'Reilly would have gone up once the Sabres were put in a position to pay the bonus. Aside from selecting 18-year-old Swedish defenceman Rasmus Dahlin with the No. 1 pick in the draft last month, he also acquired play-making forward Conor Sheary in a trade with Pittsburgh last week. The Sabres addressed their goaltending needs by signing former Blues backup Carter Hutton to a three-year, $8.25 million deal Sunday. O'Reilly was expendable because he was one of the few assets the Sabres could trade. And he also caused a stir during an end-of-season availability by suggesting there were times he had lost the passion for hockey and that a losing culture had crept into the locker room. Perron returns to St. Louis for the third time in his NHL career after signing for $16 million over four years. He spent last season in Las Vegas, where he set career highs with 50 assists and 66 points. Bozak, who signed a three-year, $15 million deal with St. Louis, spent his first nine seasons in Toronto, where he scored 136 goals and 365 points in 594 games. Notes: Buffalo signed goalie Scott Wedgewood, who is expected to take over the starting duties in the minors. ... Forward Scott Wilson returned to Buffalo by signing a two-year, $2.1 million contract. ... The Sabres also signed defenceman Brandon Hickey to a two-year entry-level contract. Hickey completed his senior season at Boston University, and was acquired by Buffalo in trade with Arizona last month. 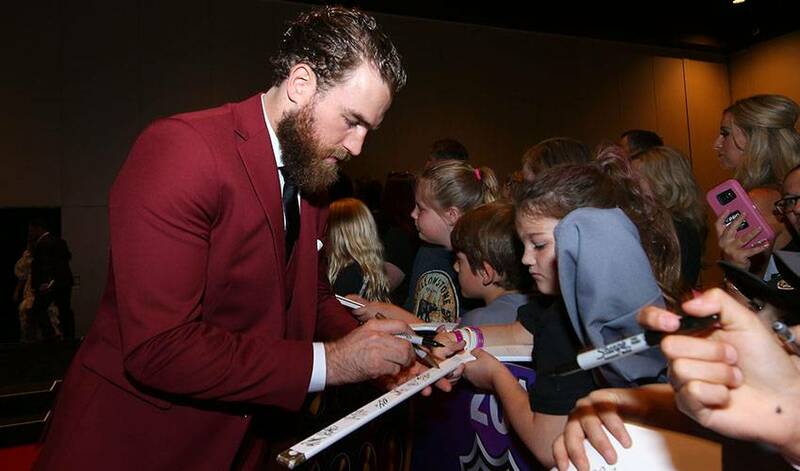 He doesn’t mind talking hockey at all, but when you mention great bands, musicians and singers – well, that’s music to Ryan O’Reilly’s ears.